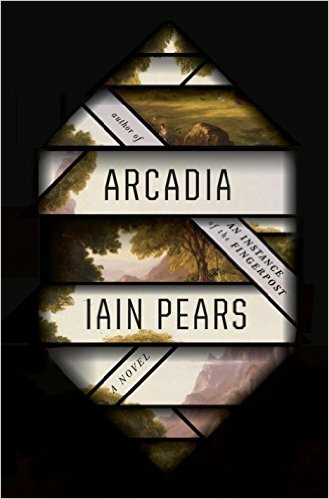 Out today in the US (last September in the UK) is Iain Pears' Arcadia. Each of his novels has moved into new territory and he manages to excel in every genre, every setting, and with a continually diverse set of characters. He is also a master of novels with multiple narratives and this one takes the cake as most complex so far. Pears even created an app that allows the reader to follow a single narrative if desired, rather than moving back and forth through space and time (although this doesn't seem to be mentioned in the US publicity so I'm not sure if the app is only available in the UK). You may know Arcadia as a utopia, first inspired by the writings of the poet Virgil and the idyllic Greek province of the same name. There is no literal Arcadia in this novel but the idea of a utopia is played with, both in how to return to one from a heavily-damaged world and also which elements would be necessary to construct one from scratch. I won't go into the characters or plots in the book, mostly because it's so incredibly complex and I honestly wouldn't know where to stop. Just know that the book starts in 1960 Oxford with professor (and British spy) Henry Litten and it ends up somewhere you would never expect. I have read all of Pears' novels (including his art mystery series) and this might be my favorite of them all. I really liked An Instance of the Fingerpost but the sci-fi/time travel aspect of this one has pushed it ahead. I loved the elements that reminded me of Connie Willis and Kage Baker's novels and I appreciated the parallels to worlds like Narnia. I also jotted down Fahrenheit 451 so there must have been some elements of that story in this one as well. But this novel was so much more than the sum of its parts and narratives. I enjoyed every moment of reading it. This sounds so great I'm almost afraid to read it in case it doesn't live up to my expectations... but I will! I sure hope you enjoy it. It's really well crafted!